Now and then you read something that makes you pause, take a deep breath, and realize that the long intellectual battle you and other like-minded people fought is close to being considered a victory. In the face of the self-righteousness, professional bullying, preening self-importance, and entitled arrogance that characterized many in the Transformationalist movement of the end of the last century and first decade of this century, the Anti-transformationalists continued forward knowing that our history was sound. We were bolstered by a confidence that our understanding of compound risk was sound, our realistic understanding of manpower and engineering truths were sound, and more importantly - we knew that a system designed by people whose power was defined by self-rightousness, professional bullying, preening self-importance, and entitled arrogance was sure to fail. The last few years, more and more standards are crossing the field. All are welcome. 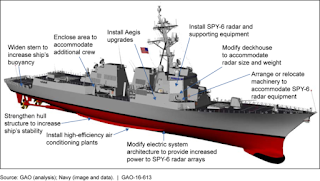 This evolutionary approach is similar to how the current Aegis combat system entered service on the CG-47 Ticonderoga cruisers in 1983 but came into its own on the DDG-51 Arleigh Burke destroyers. The Navy is laboring mightily to reduce that risk on Flight III with simulations and land-based testing, including a full prototype of the new power plant being built in Philadelphia. ...DDG-1000 is a dead end, too large and expensive for the Navy to afford in quantity. The Navy truncated the class to just three ships and restarted Arleigh Burke production, which it had halted on the assumption the Zumwalts would be built in bulk. Today, the Zumwalt‘s very mission is in doubt. The ship was designed around a 155 mm gun with revolutionary rocket-boosted shells, but ammunition technology hasn’t reached the ranges the Navy wanted for the original mission of bombarding targets ashore. With the resurgence of the Russian fleet and the rise of China’s, the Navy now wants to turn the DDG-1000s into ship-killers, which requires even longer ranges because modern naval battle is a duel of missiles. The gun’s place in ship-to-ship combat is “probably not a significant role, at least not at the ranges we’re interested in,” Galinis told reporters. While the Navy could invest in long-range cannon ammunition, he said, it’s paused work on several potential shells it test-fired last summer, awaiting the final mission review. If the Zumwalts do move to the anti-ship mission, which Galinis said they would be well suited for with minor modifications, their guns will be less relevant than their 80 Advanced VLS missile tubes or future weapons such as railguns drawing on their prodigious electric power. What missiles that you have right now? Not that you'd like to have - but what you can get underway in 2018-20 in any quantity to make a difference in a fleet engagement in WESTPAC? What happens when you quickly go Winchester w/those few you have? What if, like we're working on, an enemy finds a highly effective counter to ASCM that causes us to shoot 10 to get 1 hit? Then what weapon do you use? Also, in every real-world conflict in our history and that of our most similar allies, warships have been called in to conduct NSFS. Look at just the last few decades, from The Falkland Islands War, to the invasion of Iraq, to the Libyan operations - the naval gun has been used much more than anyone thought at the start. In The Falkland Islands War, they shot the liners off some of their 4.5" guns. Railguns might ... might ... be a weapon of the 2040/50s, but what will we have to fight in 2025? 2030? We lost an entire generation of shipbuilding because the Transformationalist were looking so far ahead, they tripped over the reality in front of them. As a result, our Navy and the nation it serves is flat-footed in 2018. No, we have not purged all the Transformationalist foolishness yet.